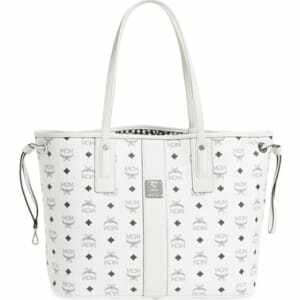 Mcm Medium Liz Reversible Shopper - White from Nordstrom. rings let you transform the silhouette from rectangular to trapezoidal, while a removable zip pouch can be worn as a wristlet, clutch or iPad case-making this chic, structured style as versatile as it is fashionable. Style Name: Mcm Medium Liz Reversible Shopper. Style Number: 215072. Available in stores.